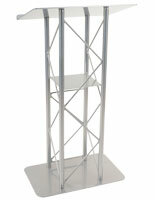 This Truss Podium that Measures 47" Tall is Ideal for All Environments. Each of These Pulpits is Great for Use in Schools, Recreational Facilities, and other Professional Locations. This Professional Truss Podium is Sure to Meet all Needs! 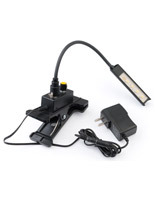 Constructed of powder-coated steel with a flat silver finish for durability and style. Unique lattice-style design for an eye-catching appearance. Stands 47" tall for comfortable presentation height. Folded lip along bottom of presenters shelf to prevent items from falling. 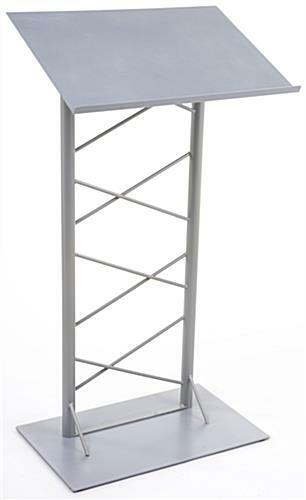 This speech stand, a truss podium that measures 47" tall is fabricated from a heavy duty powder-coated steel with a silver finish that compliments any environment. Each of these pulpits features a unique lattice style design that draws attention to the eye-catching pulpit without being distracting from the speaker. 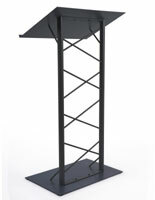 This non-aluminum professional truss podium accentuates any meeting space and is great for all speaking engagements! Professional businesses often choose pulpits like these as they are economically manufactured and offer a great value! 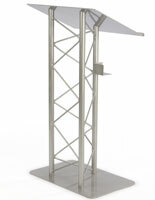 This sturdy truss podium, such as the steel lectern, is an important speaking engagement tool. 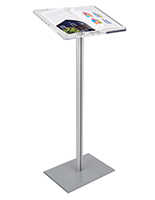 Each presentation stand is sturdy and durable, yet light enough that it can be moved easily, making it highly portable. This truss podium that compliments any environment is Ideal for any professional setting including offices, schools, churches, recreational facilities, or another location. Shipped fully assembled, these pulpits are ready for use immediately after opening! 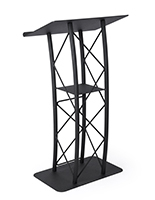 Each truss podium that is constructed of a powder-coated steel with an attractive silver finish provides a great platform for speeches and presentations and includes many great features. Each lectern features a slim design offering customers a stable presentation pulpit, but without the bulk of more traditional lecterns. 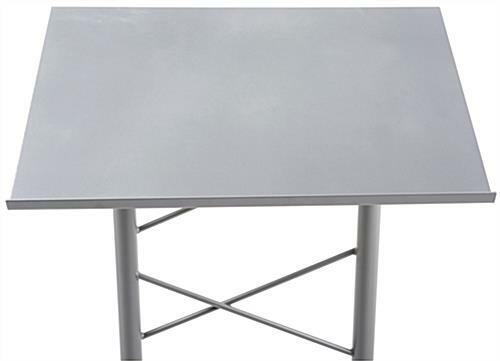 This non-aluminum truss podium that stands tall features a steel base measuring 25"w x 15-7/8"d which allows these pulpits to be used in smaller conference rooms and other small spaces, as they take up minimal room. 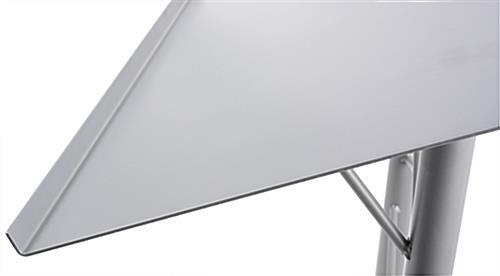 The presenter's shelf at the top of the lectern measures 25"w x 17-1/2"d and features a curved lip that runs along the bottom of the shelf and prevents items from falling. 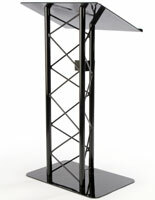 Each truss podium featuring a unique lattice design stands 47" tall, falling at a comfortable height for speakers of average height to rest their hands or store presentation notes during a speaking engagement. 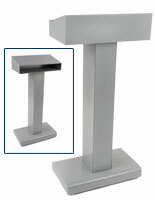 Each of these silver pulpits is the ideal presentation tool. 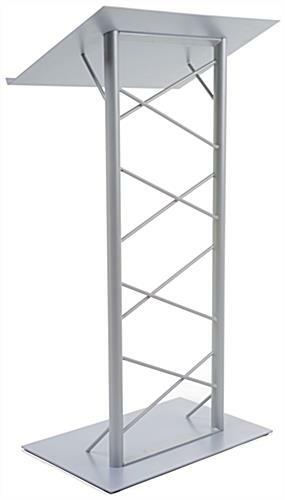 This truss podium ideal for any professional environment is sure to please and will last! 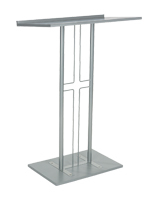 27.8" x 47.0" x 17.5"
A nice indoor or temporary use outdoor podium. Heavy duty and well built. Only complaint is I purchased two and one was bent upon opening the box. Hi Mickey, We're sorry to hear one of the podiums arrived bent! One of our customer care specialists will reach out promptly to assist. Thank you for letting us know!